UNITED NATIONS, December 9 -- The U.S. is said to be a forgiving country, a land of re-invention of self. 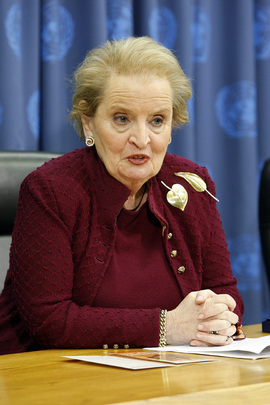 How else to explain Madeleine Albright, who in 1994 while serving on the Security Council pushed to remove UN peacekeepers from Rwanda during the genocide, showing up Tuesday at the UN along with William Cohen as experts to advise Barack Obama on the prevention of genocide? Certainly, a person who has erred is in a good position to help successors avoid the same mistake. But Ms. Albright's introductory remarks to the Press did not mention the word Rwanda. So Inner City Press asked her, as the U.S. Permanent Representative during the Rwanda genocide, what lesson she has taken from it, and from the Council's dealings with the Democratic Republic of the Congo? Video here, from Minute 10:44. Ms. Albright could only say that people had been distracted by Bosnia and Haiti and, she said, Somalia "where the Black Hawk helicopter had been shot down." We were doing things, she said. But she did not address the connection, that following the deaths of American service people in Somalia, President Bill Clinton decided that not only no Americans, but no other peacekeepers should take action in Rwanda. Belgian peacekeepers had been shot, and Belgium wanted to leave. Today, Belgium says it is interested in sending peacekeepers to its former colony the Congo, but won't because the European Union doesn't agree. The EU is deploying in Kosovo. What has been learned? "I do think there are various aspects of the tragedy of Rwanda that obviously weigh very heavily on all of us that had anything to do with it. And I do think there are lessons there that have been incorporated into some of these suggestions. "The other part that I think is truly germane and why you need people spending time on this, for those of you who were here during that period, you know that it isn't as if we weren't doing anything. We had been in Somalia, the Black Hawk helicopter had been shot down, we were in Bosnia, we were looking at Haiti." News analysis: rather than "never again," this is a recipe for "again and again."